The current version of A-Frame is 0.3.2, which means it's highly experimental, but it already works and you can test it right away in the browser. It runs on desktop, mobile (iOS and Android), and Oculus Rift, Gear VR and HTC Vive. Making sure you are using a modern browser with good WebGL support (and WebVR support if you have available VR hardware) such as the latest Firefox or Chrome — download Firefox Nightly or Chrome (v54 or higher). (Optional) set up a VR device such as Oculus Rift or Google Cardboard. Create a new directory to store your project in. Open the A-Frame documentation in a separate tab — it is useful to refer to. This contains some basic information like the document charset and <title>. The <script> element includes the A-Frame framework in the page; we will write our example code inside the <body> element. A scene is the place where everything happens. When creating new objects in the demo, we will be adding them all to the scene to make them visible on the screen. In A-Frame, the scene is reperesented by a Scene entity. Note: An Entity is any element — it can be an object like a box, cylinder or cone, but it can also be a camera, light or sound source. 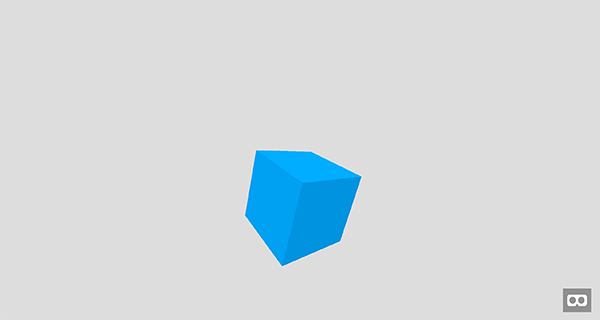 It contains a few parameters already defined: color, position and rotation — these are fairly obvious, and define the base color of the cube, the position inside the 3D scene, and the rotation of the cube. Note: The distance values (e.g. for the cube y position) are unitless, and can basically be anything you deem suitable for your scene — milimeters, meters, feet, or miles — it's up to you. You can also check it out on GitHub. A default light source and camera are included, so the cube is visible. There's even an "Enter VR mode" button in the bottom right corner of the screen, to allow you to shift to full screen, stereoscopic image viewing if you have the necesary VR hardware set up and ready. We've also defined a cursor for the given camera, using the cursor-* attributes (by default it is invisible.) — we've set its scale so it will more easily visible, its color, and some opacity so it won't completely covering the objects behind it. The directional light has a white color, its intensity is set to 0.5, and it is placed at position -1 1 2. The ambient light only needs a color, which is also white. Our entity has a torus primitive, which represents its shape. We are passing some initial variables to that shape: the radius of the outer edge of the torus, the radius of the tube, and number of segments along the circumference of the tube face respectively. Rotation and position are set in the same way as we saw earlier. 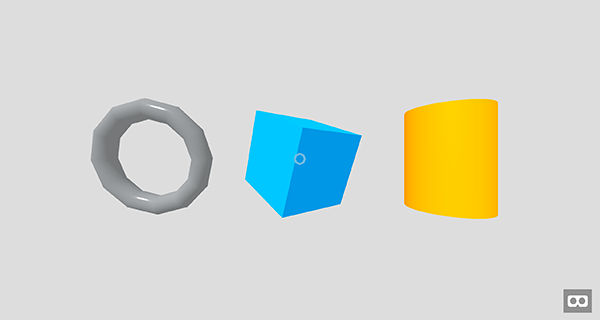 In the new material attribute, we set up the color of the material, then its roughness (a rougher material will scatter reflected light in more directions than a smooth material) and metalness (how metallic the material is). We've already used rotation and position to move the shapes on the scene, and we can also scale them. These attributes can be manipulated to create the illusion of animation. As with any other entities, you can define key properties for the animation. We'll be animating the rotation attribute from 20 0 0 to 20 360 0, so it will do a full spin. The animation direction is set to alternate so the animation will be played forward, and then back. The duration is set to 4 seconds, and it will be repeated indefinitely. The animation uses ease for easing, with tween.js being implemented internally. The attribute we want to animate for the torus is scale. The initial, default scale is 1 1 1, and we're going to animate it to 1 0.5 1, so the y axis will be scaled from 1 to 0.5. The easing we're going to use is linear. By setting the direction to alternate the scale will be animated to 0.5, and then animated back to 1 during 2 seconds. Again, the animation is being repeated indefinitely. We're using the render() function to update the cylinder's position on every frame. Try changing the given values on the y axis and see how it affects the movement. If you have a VR device available, now is a good time to try out your scene with it too. Note: You can also check it out on GitHub.